Santa may rely on elves and reindeer in other parts of the world but, in South Africa, Santa’s little helper is Spingolph the Christmas springbok. Springolph grazes the savannah with all the other springboks most of the year, but all through December he’ll be busy delivering presents to Springbok Casino players. To start with, everyone gets 25 free spins on Springolph’s favorite slot game, Bubble Bubble (coupon code: SPRINGOLPH). 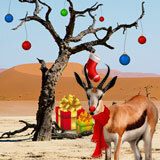 The Christmas Springbok is delivering free spins on Christmas slots to Springbok Casino players. Springolph will be emailing players about more special Christmas bonus offers. As the holidays approach he’ll have free spins on Christmas slots like Naughty or Nice, Santa Strikes Back, Rudolph’s Revenge and the Return of the Rudolph. Springbok Casino recently launched a free app for Android smartphone and tablet users. The new App is the quickest and easiest way for mobile casino players to get to the casino and play games. Installing the App is simple – just go to the App page on the casino’s website and tap “Download Now”.